North, it is where are the most splendid beaches, Benidorm and their sandy ground of the east and the west beaches, or towns of a singular character like altea, on the top of a hill offers fantastic mediterranean views. Javea, Benisa, Denia, Escalon also have great and quite beaches. Towards the south we can find Alicante with a beach really beauty "postiguet", white sand and surrounded by the sea front, you can find the train "Cercanias" who will take you from north to south, crossing incredible places. Santa Pola, fishing town specialized on paella. Follow the villages of Torrevieja, La marina,. . .
Alicante can boast with the fact of having the largest number of beaches qualified as “excellent” in the Community of Valencia according to the examination carried out by Medio Ambiente which inspects the water quality, the maintenance of the beaches and their services. That’s why it is hard to choose between the 244 km of its coastline. However we have selected here some of the best beaches of Alicante and which are great if you want to spend a day at the sea enjoying the best the Costa Blanca has to offer. Miles of white sand in the south of Alicante linked to the beaches Urbanova, El Altet and Los Arenales del Sol, which are also very good. The beach El Carabassí is situated in a sparsely populated area, although it can be very busy is summer due to its easy access and its high-quality water. There we can find some chiringuitos (beach restaurants) as well as hammock and parasol rentals. It is a perfect beach if you want to lie down in the sand, bathe in the water or take a walk/jog along the shore without fearing that the beach ends at some point. In the southernmost part of the beach people can practice nudism. From the Carabassí we can see in the south the island of Tabarca. Here we have some of the most spectacular sea depths of the province, an ideal environment to enjoy diving in a protected sea reservation. It disposes of a busier beach with various services, however I recommend to explore the area in order to find a small bay (generally with little sand and rocks) where you can bathe at rest, but with appropiate footwear if you opt for the rocks. A piece of advice how to get to Tabarca. You can go by ship from Alicante or from Santa Pola. The track is much shorter from Santa Pola and we will be glad for it if the sea is somewhat agitated. This one is the other beach with the qualification “Excellent” and a blue flag. It is one of my favourites in low season because of the area’s calmness and its clean, transparent water. The beach runs parallel to the promenade and its palm trees, situated next to Punta Bombarda, and is a pebble beach. It disposes of all necessary services in high season and, different from the previous beaches, offers a big assortment of nearby hotels and shops, as well as bars and restaurants where one can savour the numerous kinds of rice. Situated in a steep coast line, it can be accessed by foot from the Hotel Montíboli which presides over them from above. The beaches received the qualification “Excellent”, too, so it is worth visiting them. The beaches are about 2 kms far from the city centre of Villajoyosa in direction Alicante. This calm little spot is ideal if you want to practice fishing and diving and l’Esparrelló permits you to practice nudism. In l’Esparrelló we find a small bay of sand and stones, whereas la Caleta, broader and more accessible, offers services like Red Cross, parasols, hammocks and showers. Its transparent water is one of the best of the province. In the southernmost zone of Jávea we find this beautiful half coarse bay. If you only like sand, then this one will not be one of your favourite destinations, though, because it consists mostly of gravel and stones. Nonetheless, it is a blue flagged beach and is worth a visit thanks to its clean water which is ideal for diving. If you are wondering how to get to Javea, you can do this by a road that runs next to a Mediterranean pinewood and we find facilities like rescue service and bars. Even though the beach is small and more and more constructions have been built in its surroundings recently, it maintains in my opinion its special charm of the still autumn mornings. 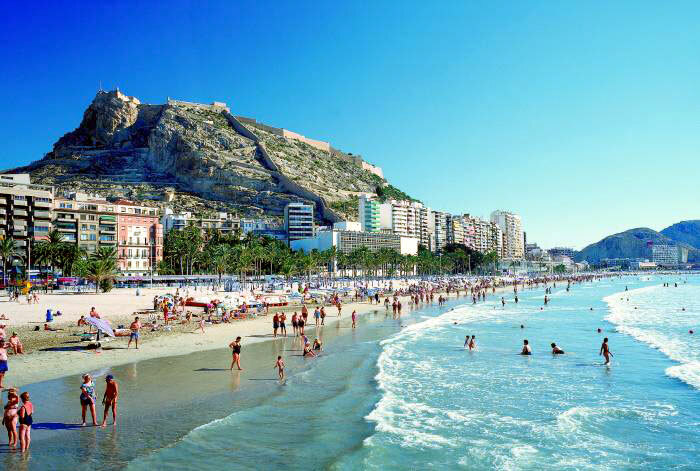 I hope this stroll has animated you to enjoy the beaches of Alicante!. Below you can find further information about Costa Blanca beaches in English, please select your language after getting into the website.